Coffee Any1? : "bing - bong" is that opportunity ringing the bell? "bing - bong" is that opportunity ringing the bell? 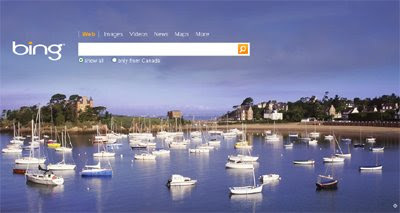 I have been hearing (or rather reading) a lot about MSN's re-vamp of it's re-branded search engine "Bing". A lot of what is being said is that Bing can not possibly give Google any grief -as people are loyal to Google and have been for years. So? If you have been online for the past few years you'll notice many sites popping up and dominating their goals....look at twitter. I'm sure facebook did not foresee the ruckus they would cause. I hope bing survives - hell I hope it does well! Nothing wrong with a little more competition - it keeps the other guys honest (and keeps their prices down in PPCs). What do I like about Bing? I love the image search on Bing - all images load into one frame so no clicking to the next page. You can choose the size of image you want to search even (weeds out the small icon-ish images). I found a new copy right infingement of my images that google missed (as the page is not linked to the sites main index). I love the pop up window in search - it scans the site - gives you 2 paragraphs of content - contact info and an idea of what other pages the site has - too kewl. No more clicking to open new windows or tabs (or back peddling to the search page). I Like it! I like that the 3D map program actually runs on my laptop (never could get google earth to work). I even like the daily background images Bing uses on it's main search page. I have heard rumors that you can find easter eggs if you mouse around (I never found any - yet). I also love that BING.COM now shows up as #10 in my top 10 traffic sources in google analytics a week after the official launch. Facebook and digg pull their ads from MSN...with the growth in social networking there may be an opportunity to getting higher search volumes (thinking with my ppc cap now). Go Bing GO....or should I say "BING-GO"